Several months ago I lost some network ports on different devices due to a power surge from a nearby lightning strike. Unfortunately, one of the devices that took a hit was the ASUS system I’m using for managing home automation. After the surge I configured the system to use wifi but it was struggling to keep up with network traffic (the system does more than just manage my home automation setup). 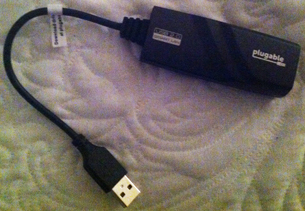 After I while I decided to purchase a Plugable USB 2.0 to Gigabit Ethernet Adapter. It’s worked great ever since and as far as I can tell I haven’t had any new problems with the system (and bandwidth has clearly improved over the wifi connection). The device retails from Amazon for about $25.